For a natural – or perhaps even laid back look, you may find just what you’re looking for in a butcher block countertop. 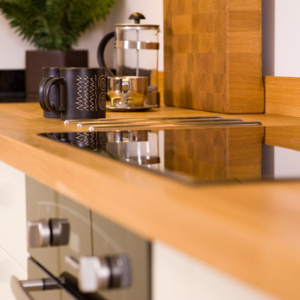 These countertops can be made out of many types of hard wood, and can also be extremely durable. In fact, a major selling point of butcher block countertops is that with the proper wood, you can actually chop your food directly on the countertop without damaging the counter or your knife. Butcher block countertops are not heat-proof, so you should not place hot pans directly on them (unless you like burn marks on your countertops). However, with the right treatment, they are extremely capable of resisting stains and moisture. If your countertops do end up with scratches, dings, stains or burns, you can simply sand the countertop down and add some oil for conditioning – problem solved. If you like the look of wood in the kitchen, but prefer to use a more renewable resource, look into bamboo countertops for your kitchen remodel. As we mentioned in a previous post on bamboo floors, bamboo is technically a grass, and therefore it is able to grow significantly faster than wood. The fact that bamboo grows so quickly (we’re talking almost two feet per-day quickly) makes it a highly renewable resource. Often used in floors, bamboo can also be a beautiful countertop option. Bamboo comes in a variety of color shades – from light to dark – and you can even alternate the colors for a beautiful striped or textured look. In addition to color options, you’re able to change the look of the countertop design dramatically by choosing between horizontal, vertical, or end-grain patterns. As with butcher block countertops, bamboo countertops are not heat proof – but, that’s what we have heat pads for, right? Bamboo is extremely durable and also very water resistant when treated. If you opt for bamboo, make sure you know the chemicals that were used in the manufacturing and that they’re non-toxic. You’ll want yours to be food safe with low (or no) levels of formaldehyde. Whether you choose butcher block or bamboo, you’ll want to be sure you keep up with regular conditioning (as needed) of your countertops. This will ensure they stay in the best possible shape, and will remain beautiful for many years to come.